Abstract: KJ is a 15-year-old boy. About a year ago he lost his appetite, felt dizzy and had double vision. Brain imaging showed a 3.8 x 3.7 cm mass in the pineal region and a 1.3 cm mass in the supra-sellar region. 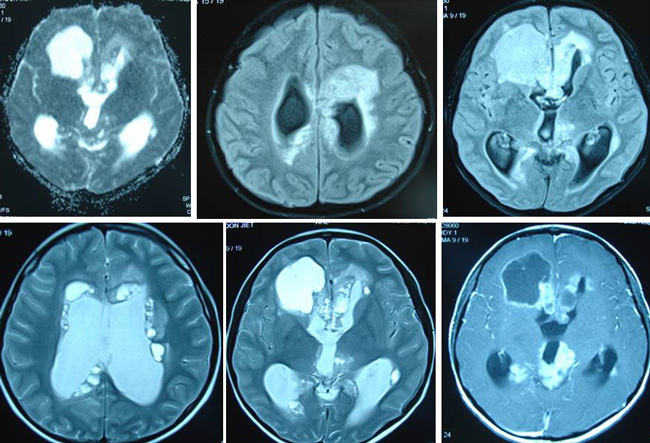 There were multiple and varying size lesions along the lining of the lateral ventricles (CSF metastases). There was severe hydrocephalus due to obstruction at aqueduct of Sylvius. KJ’s problem was diagnosed as extensive pineal gland germinoma with hypopituitarism and diabetes insipidus. The doctors suggested chemotherapy and radiotherapy but KJ’s parents refused further medical treatment. Benign brain tumours – they consist of harmless cells and have distinct boundaries. Surgery may be able to cure this type of tumours. Examples of benign tumours are hemangiomas, gangliogliomas and meningiomas. Malignant brain tumours – they consist of cancerous cells. This type of cancers is said to be the most devastating, feared and lethal of cancers that affect human. Most of these tumours are classisifed as gliomas. Metastatic brain tumours – they are much more common in adults. Metastatic brain cancers spread from other organs of the body to the brain, e.g., spread from the lungs. Brain cancers occur in both children and adults between ages 50 to 60. The second most common cause of cancer death in children up to 15 years old is due to brain cancers. This represented about 20% of cancers in children. It is also the second most common cause of cancer death in people ages 15 to 34. Brain cancer is the third most common cause of cancer death in males ages 35 to 54. Unfortunately, the incidence of brain cancers is increasing. Even though brain cancers seldom spread to other parts of the body, they do cause a lot of damage. The cause of primary brain cancers is unknown. KJ (H477) is a 15-year-old boy. About a year ago he lost his appetite, felt dizzy and had double vision. Brain imaging done on 3 November 2010 showed a 3.8 x 3.7 cm mass in the pineal region and a 1.3 cm mass in the supra-sellar region. There were multiple and varying size lesions along the lining of the lateral ventricles (CSF metastases). There was severe hydrocephalus due to obstruction at aqueduct of Sylvius. KJ’s problem was diagnosed as extensive pineal gland germinoma with hypopituitarism and diabetes insipidus. A VP shunt was installed to help with the fluid accumulation. The doctors suggested chemotherapy and radiotherapy but KJ’s parents refused further medical treatment. KJ was brought to another hospital where the family was similarly told that KJ had to undergo chemotherapy and radiotherapy. The family declined. KJ was brought to seek our help on 3 December 2010. He was prescribed Capsule A, Brain 1 and Brain 2 teas, CT + Brain leaf tea. One day on these herbs, JK felt dizzy. After that there was no more problem. KJ condition started to improve after taking the herbs. He became more energetic and alert. The following are his AcuGraph readings taken on 3 December, 17 December 2010, 31 December 2010 and 1 April 2011. Figure 2: Acugraph reading on 3 December 2010. His fist visit. Figure 3: AcuGraph reading on 17 December 2010. His second visit. Figure 4: AcuGraph reading on 31 December 2010. His third visit. Figure 5: AcuGraph reading on 1 April 2011. His fourth visit. After taking the herbs, KJ’s parents said he was getting better. He was more energetic and by the third visit his AcuGraph reading showed tremendous improvements (Figure 4). There were no complaints. We told KJ’s parents to continue doing with what they have been doing that made KJ well. Three months later, KJ came to our centre again. The AcuGraph reading (Figure 5) showed deterioration although we were told that KJ was doing even better than before. Without the AcuGraph reading we would have taken the parent’s words without question. But how could KJ be better off than before when his AcuGraph reading showed that his condition had deteriorated? Listen to our conversation that day. When we showed the parents that KJ’s reading was not good, the mother immediately admitted that KJ had not been taking care of his diet. For the past two months he had been taking meat – pork, chicken, etc. Cancer patients were advised not to eat any form of meat. In the first month on our therapy, KJ was doing well and he took care of his diet very well. His condition improved as indicated in the reading on 31 December 2010. This is one problem which we often encounter with most cancer patients. When they come to us in a serious or “terminal” condition, they will follow our advice! The moment they get well they go astray – giving whatever excuses and justification for doing what they did. It is alright with us if they do well. The problem is they do not. And when they don’t do well they come back to us complaining and complaining. Of course they would not admit that they have not been following our advice. They will only tell us what they want us to know. There is no way that we can detect any untruth and accept what they say as the truth leaving us wondering what had gone wrong! Thanks to the AcuGraph! This equipment has become a “detective tool” for us to monitor our patients’ progress. We could pick out what had gone wrong ahead of what patients care to admit. And we are able to warn our patients about it. Patients generally admit their misadventure if we show them that we have the evidence!